As the outdoor thermostat makes a steady decline, you are most likely thinking of ways that you need to prepare for the approaching winter months. With the cold comes a set of unique risks and hazards to the normal function of your home. Taking a few moments to perform some preliminary checks and chores can provide you with a great advantage to making it stress-free through the winter. Check gutters and roof for any cleaning, repair or replacement needs. Inspect and replace weather stripping or caulking around doors and windows. After your furnace is installed properly, continue to have it routinely inspected and replace filters. Get the fireplace inspected and cleaned if necessary. Test smoke and CO alarms. Change filters and clean humidifier. When the water inside a pipe freezes due to cold weather, it will naturally expand. Most pipes are not made from material that is designed to expand with this change which can result in cracks or complete breaks of the pipe lines. A crack or break can then lead to an incredible amount of property damage. Be sure your exposed pipes are insulated against the cold. The most vulnerable pipes are those that have no insulation especially those that are outside, in an attic, or basement. Find and repair, or patch, any areas that allow an air leak to come in contact with your water pipes. Outdoor hoses should be removed from the spigot and whenever possible the line should be drained and closed off using an indoor valve. Drain outdoor pools and water features. Extreme cold can present special problems when it comes to preventing freezing. Allowing a faucet to drip hot water will help to keep the line open and fend off freezing. Open cabinets to allow the interior heat to warm pipes found within them. Never set your thermostat lower than 55 degrees Fahrenheit. This is a great tip if you are planning on leaving your home for a vacation and plan to lower your thermostat to conserve energy while away. Sometimes, even with the best precautions pipes will still freeze, in some instances you may be able to address the situation yourself. 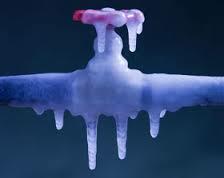 It is a strong indicator that you may have a frozen pipe if the faucet only delivers a trickle of water or nothing at all. Leave the faucet completely open while you search for the location of the problem. If you are able to locate the exact place that the pipe has frozen, the most popular method to correct the issue is to use a hairdryer. Other options to slowly thaw the spot include wrapping an electric blanket around the line or wrapping the line with a cloth towel and slowly pouring hot water over it. Standing heaters are not recommended and it is never advised to use any type of open flame on or near the pipe. For your personal safety, never perform this job if there is standing water, always contact a professional plumber. If you see there is a crack of any kind, or there pipe has already ruptured, you must immediately contact a plumber to address this emergency. Always shut off the main water valve if there is damage evident to the line.